explosive performances at Woodford folk festival and their exclusive New Years Eve release of their single "New Day". The song features the energetic vocals of their Caribbean lead singer Sharon Brooks. "It's been a year of big changes for all of us in the band" mentions Sharon. "We wrote this song to reflect what happened last year and usher in the new year on a high note." Indeed it did, with PocketLove’s energetic, floor stomping performances being rated as one of Woodford Folk Festival's best live Shows for the year. Sharon continues "We quite weren't expecting the huge amount of enthusiasm from the crowd for the entire festival, "especially when the crowds were doing our backing vocals for a few songs, the sound engineers had to keep turning up my vocals to match!" 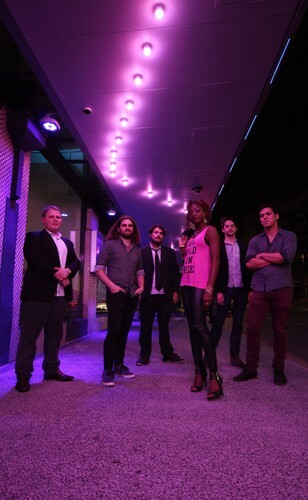 This trend is set to continue with a string of live shows in Brisbane culminating in the release of their latest single "Sweet Georgia Brown" at The Motor Room on Friday, January the 30th. "We love playing at the Motor Room Added Sharon. "because it is free entry and it's in West End you get a real mix of different people' "Last time we played there we had a mixture of old hippies, young hipsters and even the cast of The Lion King wearing out the dance floor." With their dynamic combination of bombastic drums, thundering bass, angelic brass, screaming lead guitar and the powerful soul singing of Sharon on top, the future is looking bright for this funky dance collective.